Throw your little girl a tea party birthday celebration. The kids, and the parents, have so much fun with this theme. Little girls in pretty dresses, sipping tea from their miniature china cups, is the sweetest thing to see! 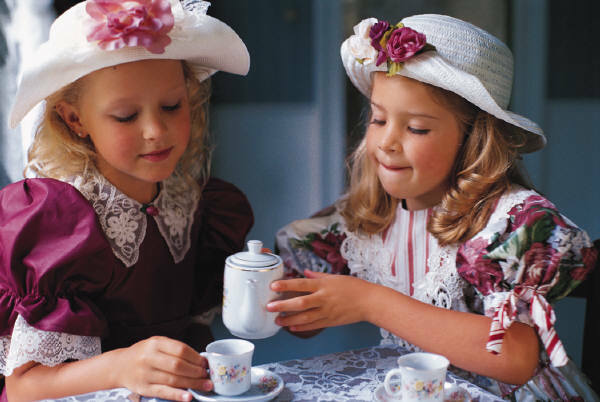 Here are some tips for throwing your little one a tea-rrific par-tea! Choose a theme for your party (i.e. Princess tea party, Victorian tea party, Mad Hatter tea party, etc.). Choose a date and time. Weekends are best for most parents. Parties usually go on for about 2 to 3 hours (at most). Choose where you want your party to take place - indoors or outdoors. Three to four weeks before the scheduled party, send out cute teacup or teapot invitations with a teabag inside. A teabag, cake, hat, or old fashioned shoe invitation are great invite ideas as well. Colour Scheme: Soft pinks, purples, yellows, and blues are ideal. Decorate your house or yard with pastel-coloured balloons and streamers. For the tables, use a pastel-coloured tablecloth and a lace cover on top. Choose napkins the same colour as the tablecloth. Fasten napkin rings (with mini roses) around the napkins and place them on top of white (or floral-designed) porcelain china. Place silverware next to the dinner plates. Place the teacups and saucers above the plates, and to the right. For placecards, cut out teabag shapes from card stock. Write out the names on each teabag placecard and tuck it into the teacup. Display the sugar and creamer near the middle of the table. As a centerpiece, place a small bouquet of flowers in a clear vase, trimmed with pastel-coloured ribbon. You could also place the flowers in a teacup or teapot in keeping with the theme. Tie a pastel-coloured bow around all the chairs. Set up a tea party table for dolls. You can even let the girls know ahead of time to bring their own dolls. Play tea-inspired music in the background. You can play some classical tunes as well as some kid favourites such as, "I'm a Little Teapot," "Tea for Two"
Have hats with ribbons and bows, as well as little white gloves, available for all the little girls attending. You can even provide some feather boas. When the girls are seated, you can go over what proper table manners are, such as saying "please," "thank-you," and, "no thank-you." Have them put their napkins in their laps, and wait until everyone has gotten their food before eating. Serve little quiche tartlets or a variety of different crustless mini sandwiches on fancy tiered servers. Some examples are cream cheese and cucumber, cream cheese and jam, grilled cheese, smoked salmon, ham/turkey and cheese, egg salad, and tuna salad. If no one is allergic to peanuts, serve peanut butter and jelly, and peanut butter and banana sandwiches as well. For dessert, serve cupcakes in a teacup. Create a teacup design on the frosting, or garnish with teacup sprinkles. You can also make your own teapot or teacup cake. Another idea is to put a variety of desserts on a tiered server. Scones, cupcakes, fruit, biscuits, etc. Tuck mini roses in between each of the different dessert items for visual effect. Serve tea of course. There are hundreds of varieties to choose from but think like a kid - they'd probably like fruit flavours, chamomile, vanilla, cinnamon, etc. You can also have water, ice tea, soda, juices, and milk on hand in case some of the kids prefer that over tea. Dress-Up - Little girls love to play dress-up. Have a chest full of old clothes, shoes, hats, gloves, scraves, etc. out so the girls can play adult for a day. 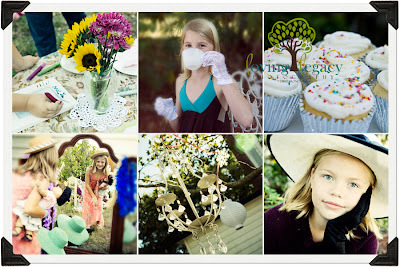 Piñata - Have the girls take a swing at the teapot or teacup piñata and dive for the goodies! Before leaving the party, hand all the little girls a purse filled with fun items such as stickers, body glitter, lip gloss, a pearl necklace, little books, and sugar cookies and chocolates shaped like teapots and teacups.